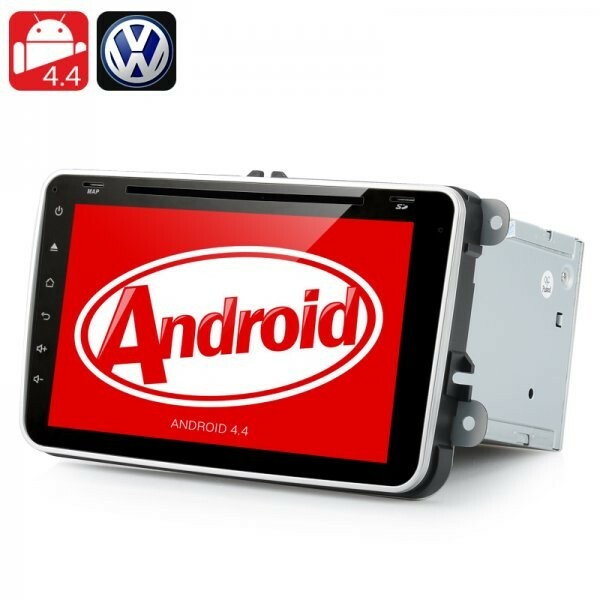 Double DIN Android 4.4 Car DVD Player Head Unit for Volkswagen Vehicles - 8 Inch Screen, GPS, Bluetooth, Wi-Fi, Supports 3G.This double DIN Android 4.4 Car DVD Player Head Unit for Volkswagen Vehicles boasts an 8 Inch Screen, GPS, Bluetooth, Wi-Fi and supports 3G. This double DIN Android 4.4 Car DVD Player Head Unit for Volkswagen Vehicles boasts an 8 Inch Screen, GPS, Bluetooth, Wi-Fi and supports 3G. Designed to fit a whole range or Volkswagen models, this car DVD player is the ultimate media system to give your Passat, Golf, Jetta or other Volkswagen models a true entertainment make-over. Slotting into the 2 DIN slot in your dashboard, this car multimedia system is the perfect choice as it brings many ways for you to enjoy entertainment whether it is via the FM radio, supported CD slot, the ability to connect online as well as having a micro SD card slot for transferring files onto it. The Rockchip 3066 1.6GHz Cortex A9 dual core processor that is housed inside is capable of running all the operations including the mighty Android 4.4 operating system that comes pre-installed. Also there is 1GB RAM and 8GB of internal memory that also supports the SoC setup. The touch screen display is larger than most as it is 8 inches in diameter and offers perfect viewing for everyone inside the vehicle. Watching movies or using GPS on this car system will be a pleasure to view with the 800x480RGB resolution. Android 4.4 KitKat has finally made it into your car after spending sometime on your phone and tablet. With Android you get to use the familiar set-up that is based on an open platform, which by connecting to the internet can be made more practical by downloading and installing applications from the Google Play store. To connect online, you can either use Wi-Fi or for a faster connection you can use a dongle to connect to a 3G bandwidth. There is so much more you can do with this Volkswagen DVD player that you will spend hours playing and not actually driving. Give your Volkswagen vehicle the upgrade it needs with this wholesale priced Android car DVD player. This product is in stock now, we guarantee next working day shipping and offer a 12 months warranty on all our products. Brought to you by the leader in electronic devices as well as wholesale Volkswagen Car DVD Players, Chinavasion.